Sales for MSC Cruises’ 2021 World Cruise are officially open today. 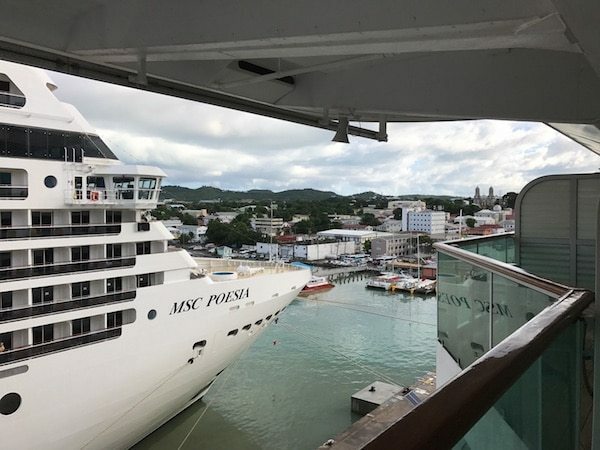 The 2021 trip will be the third world cruise for the line, 119 days long, and take place aboard MSC Poesia departing January 5, 2021. The all-new itinerary has a significant focus on unique destinations in Asia, and has been designed to allow guests to go more in-depth in these locations than ever before. The voyage sails roundtrip from Genoa and Civitavecchia in Italy, Marseille in France, and Barcelona in Spain – depending on whether guests want to do the entire journey or smaller segments. The first leg crosses the Atlantic to the islands of the Caribbean and through the Panama Canal, then sails the west coast of the continent to San Francisco. The second leg visits Maui and then volcanic Hawaii, Samoa, and Fiji. After that, Poesia will call at Auckland, New Zealand, Sydney, the Australian Golden Coast, Cairns and the Great Barrier Reef, Papua New Guinea, and the Philippines. The ship will then arrive in Japan during its stunning cherry blossom season. After visiting Kyoto, Tokyo, and Shanghai in China, the third leg heads to Hong Kong, Vietnam, Singapore, and Malaysia. Then the ship will cross the Indian Ocean to Sri Lanka and Dubai, and guests can explore Oman and Jordan before traveling through the Suez Canal back into the Mediterranean. MSC Poesia, as seen from onboard another cruise ship. Puerto Limon, Costa Rica – The stunning beaches and lush rainforest are havens for any nature lover. Here, passengers will have the unique opportunity to interact with native sloth species or discover the rich history that the second largest city in Costa Rica has to offer. Other excursions include journeying into the jungles to see waterfalls and butterflies, and more. San Francisco – Guests will not want to miss a chance to see the iconic Golden Gate bridge, visit the famous penitentiary-turned-prison of Alcatraz, or taste the local California wines in one of the United States’ most famous cities. The ‘San Francisco and Golden Gate Bridge’ tour — one of the many unique shore excursions featured on the cruise — is the ideal way to take in these landmarks during your stay, offering a variety of can’t-be-missed sites in one trip. Honolulu – Hawaii is renowned for its sandy beaches, crystal clear waters and massive volcanoes. On Oahu, the Hawaiian capital is home to all three of these treasures, where guests can partake in a luau or simply say ‘aloha’ to a day of sunbathing on the famous Waikiki Beach. To discover the city, as well as learn some of its most moving history, the ‘Pearl Harbor & City Tour’ will take guests from sunken submarine and battleships to pearls of the ancient Hawaiian kingdom. Sydney, Australia – Sailing by the Sydney Opera House and towering Harbour Bridge, guests will have two days to explore the iconic Australian city. Whether they choose to visit the famous Taronga Zoo for a chance to see real-live kangaroos or learn to surf at Bondi Beach, this destination is for everyone. One way to truly experience the city is a bridge climb excursion, where guests will ascend the 440-ft. tall bridge for a panoramic view of the city while their climb leader details the history from 1932 until now. Tokyo, Japan – The bright lights of Tokyo are one of six Japanese cities that MSC Poesia will visit during the world tour. With a plethora of authentically Japanese activities to experience, guests may choose between traditional tea ceremonies, observing Sumo wrestlers’ morning practice sessions and discovering the restaurant offerings that make Tokyo the most Michelin-starred city in the world. Shanghai, China – One of China’s most iconic cities will allow guests to immerse themselves in the Far East, visiting the Jade Buddha Temple, walking along the Bund waterfront or taking a day trip to the Zhujiajiao water town, where the historic homes and bridges will have guests feeling they’ve stepped back in time. Hong Kong – This vibrant metropolis is where East meets West, and guests will be amazed by the many modern skyscrapers that paint the city’s skyline and delighted by the rich history, such as the Tian Tan Buddha. Da Nang, Vietnam – Vietnam’s fifth largest city is one of the country’s most beautiful. Guests may opt to climb the one-of-a-kind Marble Mountains, bask in the sun on My Khe Beach or discover the many stunning pagodas that the city is known for. Singapore – Framed by the unmistakable Marina Bay Sands Hotel and the city’s symbol, the Merlion, Singapore is a paradise for shoppers, with breath-taking malls that are as beautiful as they are well-stocked. The historical Raffles Hotel and marvelous Gardens by the Bay make this small island a taste of the best of both worlds, modern meets classic. The ‘Highlights of Singapore’ shore excursion, for example, mixes classic coach and walking tours and will allow guests a chance to take in the many neighborhoods of the city, starting with the exotic Little India. Aqaba, Jordan – This city rests on the Red Sea coast and is a haven for divers and history buffs alike. From snorkeling in the Aqaba Marine Park to Mamluk Castle and the Aqaba Archaeological Museum, Aqaba has something to satisfy everyone’s interests. Today, sales for this 2021 World Cruise are open only to MSC Voyagers Club Members. On January 10, bookings will open to all guests. Staterooms start at $15,349 per person, and each person receives a set of 15 included shore excursions, as well as a mealtime package. Click here for more information.